Democrats will eventually try to deflect attention by blaming this shooting in Northern Virginia on guns. The popular narrative is that guns kill and the right are the gun crazy people who generate violence in America and around the world. The facts are much different with regard to gun violence and they are much different with regard to political violence. Throughout our history, radical leftist have performed major acts of violence in this country. From the Democrat who assassinated Abraham Lincoln to the Marxist who assassinated John F. Kennedy, from the anarchist who assassinated President McKinley to Manson family member Lynette ‘Squeaky’ Fromme who attempted to assassinate President Ford, lunatics from the left have always been unable to handle their political frustration without violence. Today, the Trump ‘Resistance’ fits nicely into that violent mold. From the college ‘snowflakes’ to the campus protestors, from the free speech deniers to the violent masked street rioters, the unbalanced left is losing it’s footing. We used to laugh at the ‘angry liberal’ as a stereotypical nuisance, but not any more. 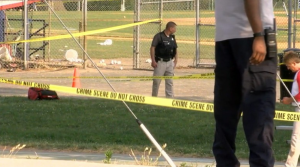 Today, at a baseball field in Alexandria, a lunatic leftist, federal law enforcement officials identified the suspected shooter as James T. Hodgkinson, 66, from Belleville, Illinois, apparently went looking for ‘Republican’ members of Congress who were practicing for a the annual Congressional baseball game. Rep. Ron DeSantis, R-Fla., [said] he left just before the shooting. As he walked to his car, a man asked DeSantis if it was Republicans or Democrats practicing. About 3 minutes later, at around 7:15 a.m., the shooting began, DeSantis said., targeting Republican Congressman in the open field one by one. With no way to protect themselves, they were sitting ducks. At this point no one has been reported killed, as armed security guards and Capitol police were able to take down the attacker. But, that was after an estimated 50 shots fired. Undoubtedly their are leftists out there who are cheering this effort to destroy their Republican opposition. Speech control & violence to them is much better than debate. Democrat elites like Hillary Clinton, Bernie Sanders & others, media networks (MSNBC, CNN, NBC, CBS, NBC) and other members of Congress who have cheered the Trump ‘resistance’ will of course denounce this shooting and blame it on guns, while whispering other things to their supporters. However, it is their public support of the ‘resistance’ violence that is making this situation worse. Donald Trump made these statements today: “We may have our differences, but we do well in times like these to remember that everyone who serves in our nation’s capital is here because, above all, they love our country. We can all agree that we are blessed to be Americans, that our children deserve to grow up in a nation of safety and peace, and that we are stronger when we are unified, and when we work together for the common good,”. The radical left needs to remember these words and live them.